THE BEST PERSONALISED STOCKING FILLER | GIFT GUIDE | RAWR BOWS. If there is one thing I am good at is Christmas presents - whether we're talking about one big massive present or just a small gift. I love brainstorming ideas, finding the perfect gift for someone and seeing their face lit up when they open it. Giving is definitley better than receiving. My favourite kind of gifts are stock fillers; small little details that come together and create the perfect surprise. There are so many options - from chocolate to socks and even stickers. Some of you may know the brand CaseApp, which offer personalisable phone cases. Turns out, they also have a service for custom stickers: StickerApp. Stickers can be used to decorate pretty much anything. I love adding loads of random stickers to my laptop, and my notebook. They make a plain boring object look mine. They are also super fun, I literally go around my house sticking stickers everywhere (sorry flatmates). I recently placed an order on StickerApp and got some just in time for Christmas. 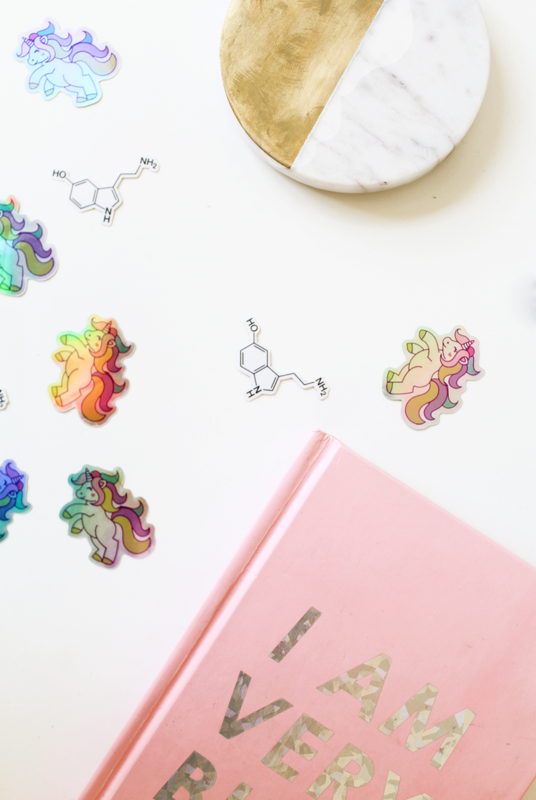 I got two different designs: the happiness molecule and, of course, a unicorn. The cool thing about StickerApp is that they offer so many different finishes, the coolest one being the holographic finish which I had to use for the unicorn. I mean, duh. The happiness molecule, also known as Serotonin (can you see all my chemistry knowledge coming through? ), is a transparent sticker which are my favourite kind because it means you can stick it anywhere and it will never look weird. It also makes it look fancier. 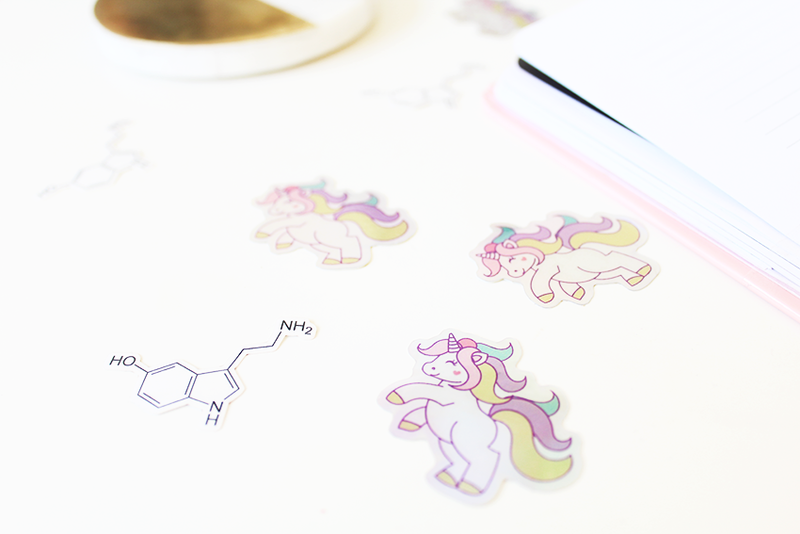 This is probably the best sticker I've ever had, it reminds me of university (I studied chemistry) and makes me feel happy (get it?). I am dead serious when I say I have been sticking these everywhere, it's getting a bit out of hand now... but they are just so cool! If you're looking for a fun, unique stock filler you should definitely consider this. You can even get the person's name printed or maybe their favourite quote so they feel inspired every time they see one of the stickers. The sky is the limit, so get creative!